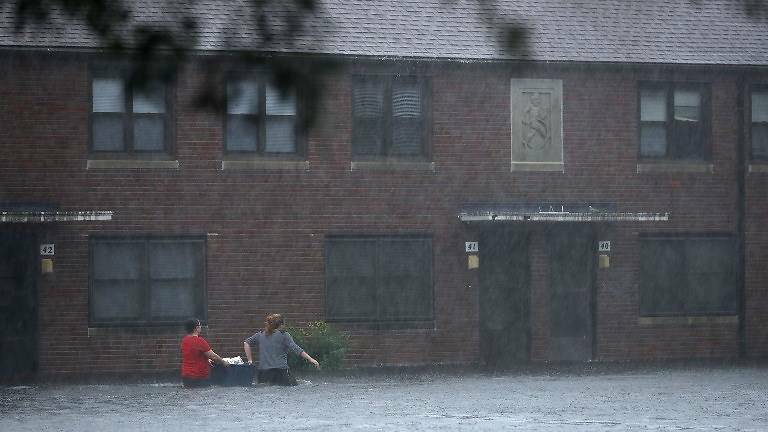 Hurricane Florence battered the Carolinas early Friday (Sep 14) with howling winds, life-threatening storm surges and torrential rains as it edged closer to the coast in what officials warned is a "once in a lifetime" event. In its 0600 GMT advisory, the center said Florence was over the Atlantic Ocean about 55km east of Wilmington, North Carolina and moving northwest at 10km per hour. It added that the maximum sustained winds were 144km per hour. Florence is now at the weakest of five categories on the Saffir-Simpson scale. In a display of the early effects of the storm, one flood gauge on the Neuse River in New Bern, North Carolina, showed three meters of flooding, the NHC said. He said hurricane-force winds extended outward 128km from the center of the storm and tropical storm-force winds extended nearly 320km out. Some areas could receive as much as one meter of rain, forecasters said. In Wilmington, residents who had decided not to evacuate were lining up to get ice from a vending machine - US$2 for a 7.2kg bag.